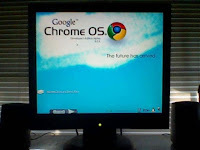 It's been just a few weeks since we first heard of about Google's Chrome OS and it's the second time that we are hearing about the screenshots/images of the OS at work being leaked. While the first "leak" was proven a false alarm, this one looks slightly more convincing. Another thing that makes this leak slightly more convincing is that these are blurred; crap images shot by a seasoned image leaker (from a Nintendo DS, apparently) who knows how to take photographs that will soon end make rounds of the interweb. The images set by an "anonymous tipster" to folks over at Downloadsquad show the Chrome OS at work. Now, before going overboard, let us mention the flip side. While this one does look more convincing than the previous attempt, there are reasons to believe this one too might be the handiwork of a person who had a lil bit of extra time at his disposal and is good at photoshop. To start off with, the UI bears no resemblance to Google's traditional, simplistic approach. In one of the images, you can also see a Linux logo. Somewhere, it just doesn't feel right! We leave it to you to decide how true (or false!) this one turns out!